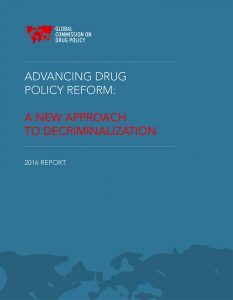 Both the stated goals of drug control policies and the criteria by which such policies are assessed merit reform. Traditional goals and measures—such as hectares of illicit crops eradicated, amounts of drugs seized, and number of people arrested, prosecuted, convicted and incarcerated for drug law violations—have failed to produce positive outcomes. Putting health and community safety first requires a fundamental reorientation of policy priorities and resources, from failed punitive enforcement to proven health and social interventions. 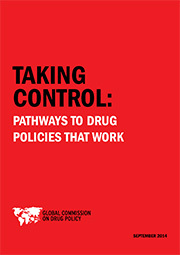 In measuring the impact of drug policies and assessing positive outcomes, it is far more important to focus on goals and measures that aim to reduce both the harms that are a direct consequence of drug use, such as fatal overdoses and dependence, as well as those resulting from failed prohibitionist and punitive policies, such as increased transmission rates of HIV/AIDS, hepatitis and other diseases, crime, violence, corruption, human rights violations, environmental degradation, displacement of communities, and the power of criminal organizations. Proven prevention, harm reduction, and treatment measures must be scaled up to meet the needs of people who use drugs. 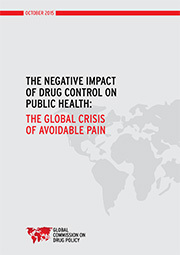 More than 75% of the world´s population carries a huge burden of avoidable pain and suffering with little or no access to essential medicines. 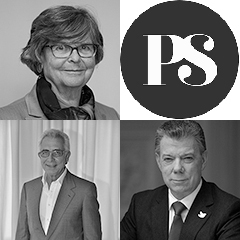 This situation persists despite the fact that the avoidance of ill health and access to these medications is a key objective and obligation of the global drug control regime, and an obligation under human rights law through the right to health. Governments need to establish clear plans and timelines to remove the domestic and international obstacles to such a provision. 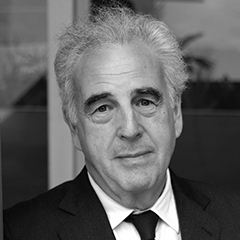 They should also allocate the necessary funding for an international program—to be overseen by the World Health Organization (WHO) and developed in partnership with the United Nations Office on Drugs and Crime (UNODC) and the International Narcotics Control Board (INCB)—to ensure equitable and affordable access to these medicines where they are unavailable. Evidence shows that the criminalization of drug use and possession has little to no impact on the levels of drug use in an open society. Such policies do, however, encourage high-risk behaviors, such as unsafe injecting, and deter people in need of drug treatment from seeking it. They also divert law enforcement resources from focusing on serious criminality, and reduce personal and government funds that might otherwise be available for positive investment in people’s lives. Finally, repressive policies burden millions with the long-lasting negative consequences of a criminal conviction. Using the criminal justice system to force people arrested for drug possession into “treatment” often does more harm than good. It is far better to ensure the availability of diverse supportive services in communities. 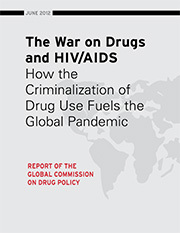 Governments devote considerable resources to detecting, arresting, and incarcerating people involved in illicit drug markets—with little or no evidence that such efforts reduce drug-related problems or deter others from engaging in similar activities. Community-based and other non-criminal sanctions routinely prove more effective and far less expensive than criminalization and incarceration. Non-violent subsistence farmers and day laborers involved in harvesting, processing, transporting or trading, and who have taken refuge in the illicit economy purely for reasons of survival, should not be subjected to criminal punishment. 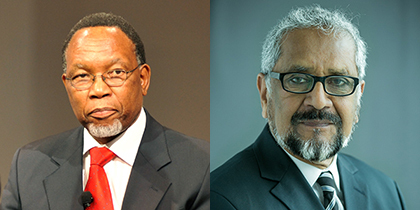 Only longer-term socio-economic development efforts that improve access to land and jobs, reduce economic inequality and social marginalization, and enhance security, can offer them a legitimate exit strategy. 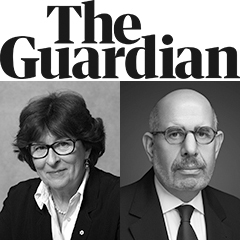 Governments must also anticipate the ways in which particular law enforcement initiatives, particularly militarized “crackdowns”, may exacerbate criminal violence and public insecurity. Displacing illicit drug production from one locale to another, or shifting control of a trafficking route from one criminal organization to another, often does more harm than good. The goals of supply-side enforcement need to be reoriented from unachievable market eradication to achievable reductions in the violence and disruption linked to the trafficking. Enforcement resources should be directed towards the most disruptive, problematic, and violent elements of the trade—alongside international cooperation to crack down on corruption and money laundering. Greater accountability for human rights violations committed in pursuit of drug law enforcement is also essential. In particular, States must abolish the death penalty for all drug-related offenses. These first four recommendations do not require any reform of international drug control treaties. 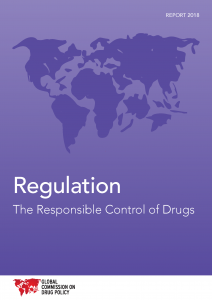 Much can be learned from the successes and failures in regulating alcohol, tobacco, pharmaceutical drugs and other products, as well as activities that induce health problems and other risks to individuals and societies. New experiments are needed in allowing legal but restricted access to drugs that are now only available illegally. This should include the expansion of heroin-assisted treatment for some long-term dependent users, which has proven so effective in Europe and Canada. 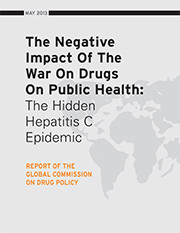 Ultimately, the most effective way to reduce the extensive harms of the global drug prohibition regime and advance the goals of public health and safety is to get drugs under control through responsible legal regulation.